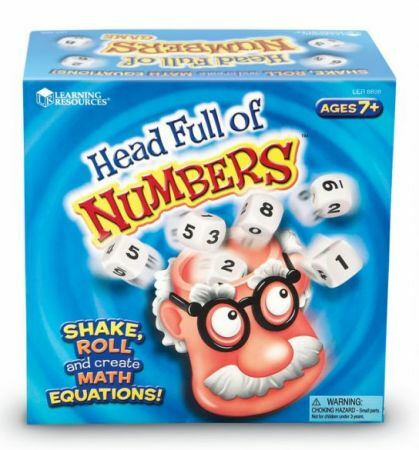 Kids will have math on their minds with this game for any number of players! From one child to the whole family, everyone will love the fast-paced fun. Place the three standard dice and three custom dice (with numbers 0, 1, 2, 7, 8 and 9) into the fun dice shaker then roll them out and place them into the dice tray. Set the sand timer and have the score pad ready to record the number of unique, correct equations each player makes using the numbers rolled. Equations can use simple addition or subtraction or include multiplication and division for a more challenging game.